Used only 2 weeks - great condition. 3 slides create huge living room. Pictures show floor-plan and condition. Camper is lifted. We are the original owners. Camper was purchased in Maine and includes insulated tanks for cold weather. 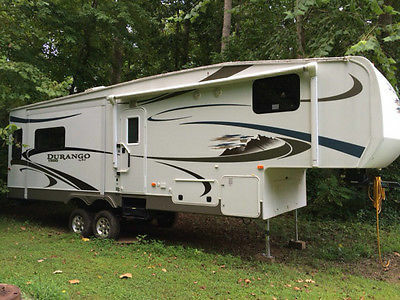 Available to see in person on weekends - north of Atlanta, GA. Not interested in calls to help sell. 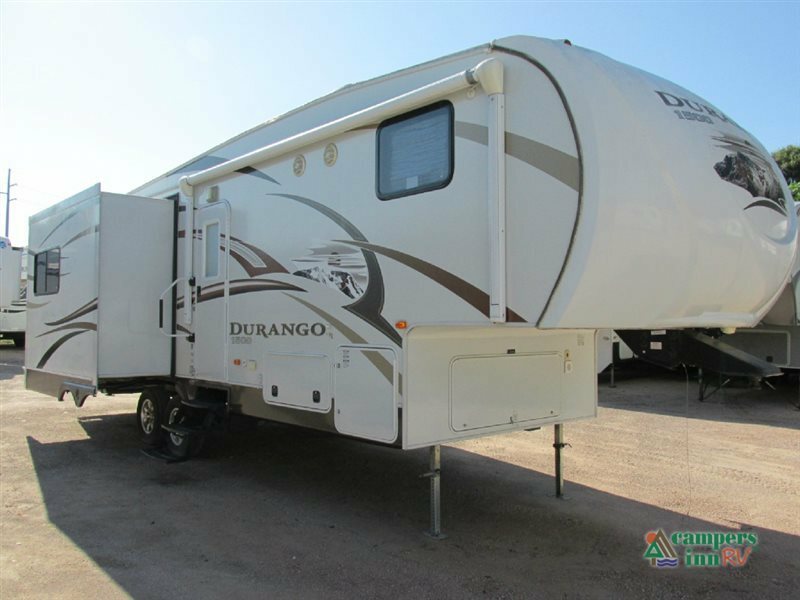 2011 KZ Durango 295CS, VERY CLEAN TRADE!! 3 SLIDE OUTS, SMOOTH FIBERGLASS EXTERIOR, FRONT FIBERGLASS CAP, ENCLOSED UNDERBELLY, POWER AWNING, 3 SLIDE OUT AWNINGS, FOLD AWAY ENTRANCE HANDLE, POWER FRONT JACKS, REAR STABILIZER JACKS, ALUMINUM WHEELS, OUTSIDE SPEAKERS, OUTSIDE SHOWER, BLACK TANK FLUSH, 6 GALLON GAS/ELECTRIC WATER HEATER, SPARE TIRE, REAR CARGO ACCESSORIE RECEIVER, ROOF LADDER, CENTRAL A/C, MONITOR PANEL, MICROWAVE, AM/FM CD DVD PLAYER, TV ANTENNA, 32" LCD TV, SINK COVER, BATH SKYLIGHT, PORCELAIN TOILET, AIR MATTRESS HDIE-A-BED SOFA, DRY WEIGHT 8,202 lbs., HITCH WEIGHT 1,280 lbs., GVWR 9,800 lbs. 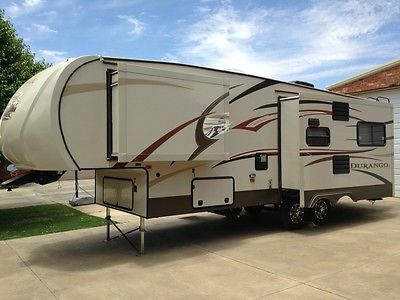 2013 Durango 1500 Fifth Wheel by KZ - Model 295CS - Like New! Price Reduced! BUY IT NOW PRICE JUST LOWERED!!! 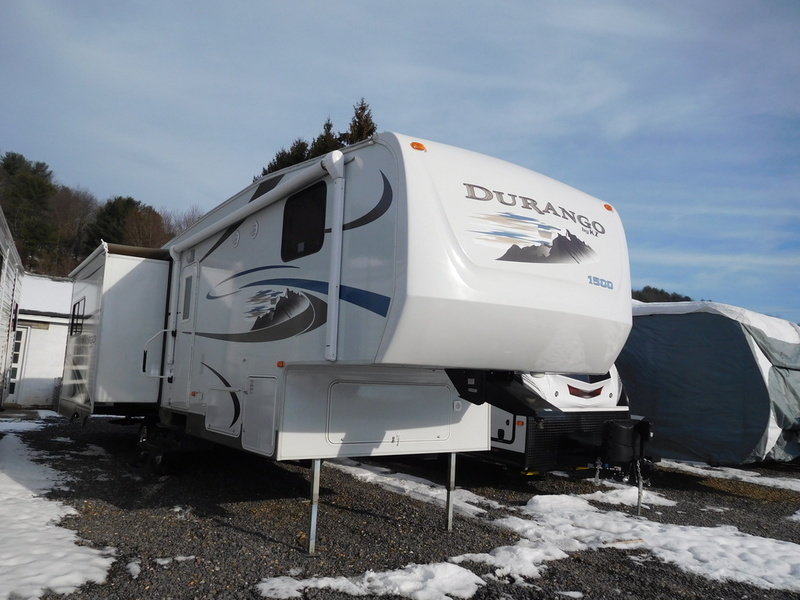 Up for sale is our beautiful 2013 KZ Durango 1500 (M-295CS). We purchased it Brand New on June 10, 2013 and haven't been able to enjoy it as much as we'd hoped (We've been spending all of our "traveling time", caring for elder parents and helping with the grand kids) If you're not familiar with KZ, you should be. 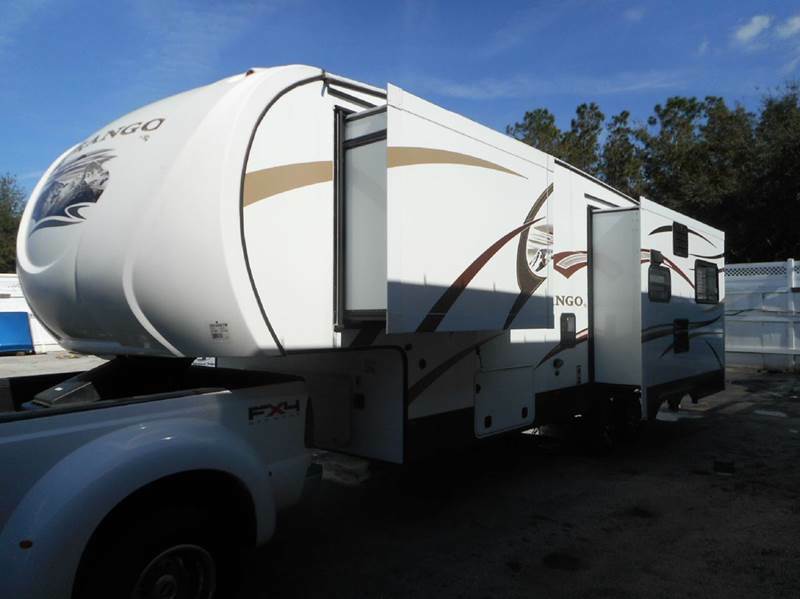 They build the highest quality 5th Wheels and Travel Trailers in this price range. While other companies fell by the wayside back in 2008 (recession), KZ survived, due to their quality products, customer service and being financially solvent. The Durango "1500" indicates that it can be towed with a 1/2 ton pick-up. We tow our with a 3/4 ton truck. Our friends tow theirs with a 1/2 ton. Either way, the Durango pulls like a dream. About the RV: It looks and smells like new (no smoking or pets), spending most of it's life inside my heated & air conditioned shop. We have only been able to enjoy it three times (Two trips to East Texas and One to Cloudcroft), so it's been on the road less than 2500 miles. Options include: .....Sandalwood Edition - Exterior paint & graphics upgrade (not your typical "white") .....Fiberglass Exterior .....Electric awning .....Diamond Shield (Road Trip) package .....Aluminum wheels with 16" tire upgrade .....Outside shower .....Entry step upgrade (4 steps instead of the standard 3 steps) .....Tons of storage with "slam-type" baggage doors (just like on those expensive motor-homes) .....Raised panel doors through-out (Real wood!) .....8 cubic foot Refrigerator upgrade (with raised panel doors) .....Microwave, Cook-top and Gas Oven .....Solid Surface counter tops with under-mount sink and covers .....Recliners (Upgrade from standard chairs) .....Hide-A-Bed sofa upgrade .....Large Dinette that converts to a bed .....Upgrade to a standard Queen Size mattress in the bedroom (not the shorter RV queen) .....32" LCD TV in Living Room .....AM/FM/CD/DVD player with Surround Sound and USB port .....Outside Stereo Speakers .....19" LED TV in Bedroom .....15,000 BTU Ducted Central Air Conditioning (Upgrade from 13.5 BTU system) .....All-Weather Package .....Dual Propane Tanks .....Too much more to mention! NADA value is shown at $43,110.00. Feel free to ask questions. If you'd prefer to "talk" about things, send me your name and phone number and I'll give you a call. Check-out my 100% Rating. Most of my sales have been high-dollar items and all of them have exceeded the Buyers expectations. You won't be disappointed! The RV is for sale locally, so I reserve the right to end this sale at any time. Shipping Note: Use the Buy-It-Now option and I'll deliver it to you or meet you, up to 500 miles from Lubbock, Texas. Otherwise, you're responsible for any and all shipping cost and the RV must be picked up within 7 days following purchase. Either way, you'll need to provide your own 5th wheel hitch. 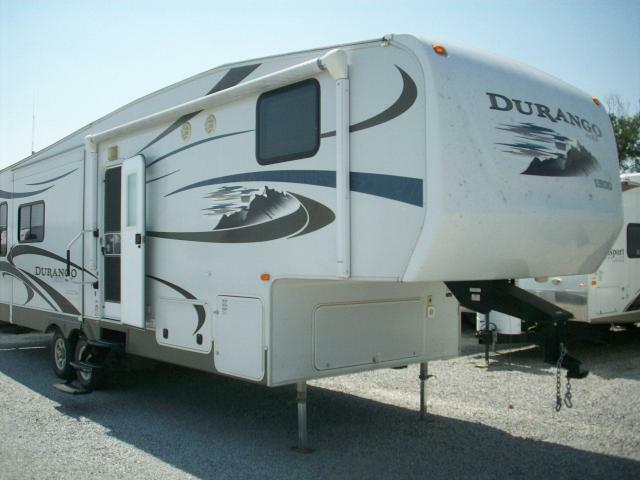 2014 KZ Durango 1500 D295CS, The Durango 1500 D295CS fifth wheel by KZ offers triple slides and a rear living area. 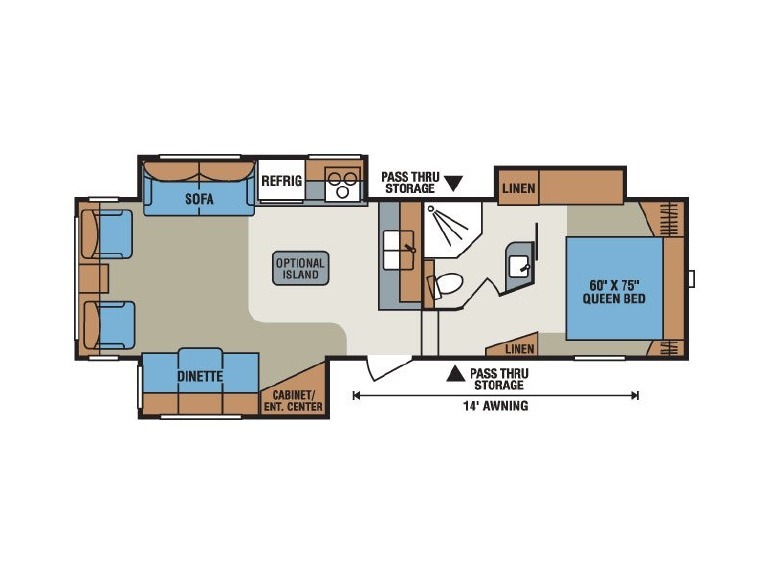 As you enter the fifth wheel, to the left is a slide with a cabinet/entertainment center and dinette. Along the rear wall there are two lounge chairs, and an end table. The other slide has a sofa, refrigerator, and three burner range. In the front of the kitchen area is a double kitchen sink surrounded by counter space. You can even choose an optional island which provides more counter space. Stepping up the stairs, the bathroom is on the right. There is a toilet, corner shower, and sink. The bathroom also has a private entrance into the bedroom. The front bedroom has a queen bed and wardrobes on either side of the bed. You will also find a linen slide and a linen cabinet on the other side of the room. There are plenty of overhead cabinets throughout the fifth wheel as well as an exterior pass thru storage area. 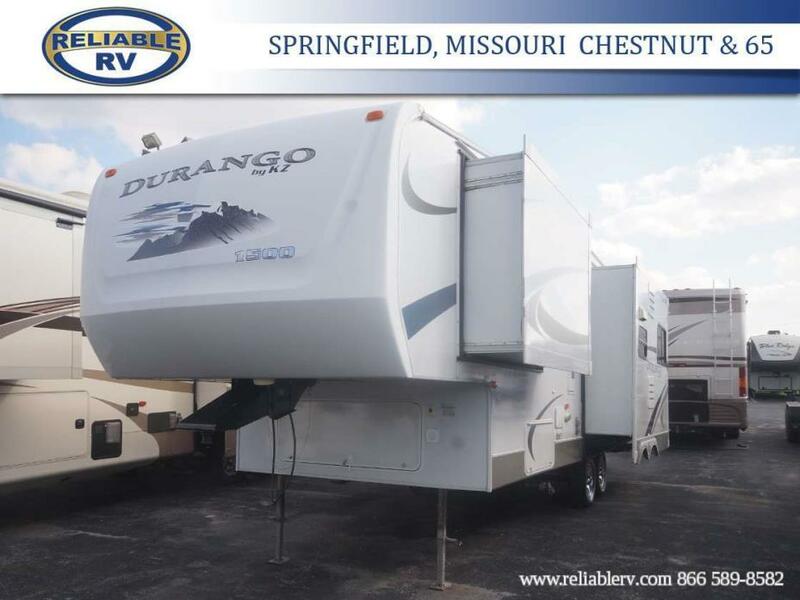 2012 KZ Durango 1500 D295CS, Triple Slide Durango 1500 Fifth Wheel, Rear Living Area, Dinette/Cabinet/Ent. 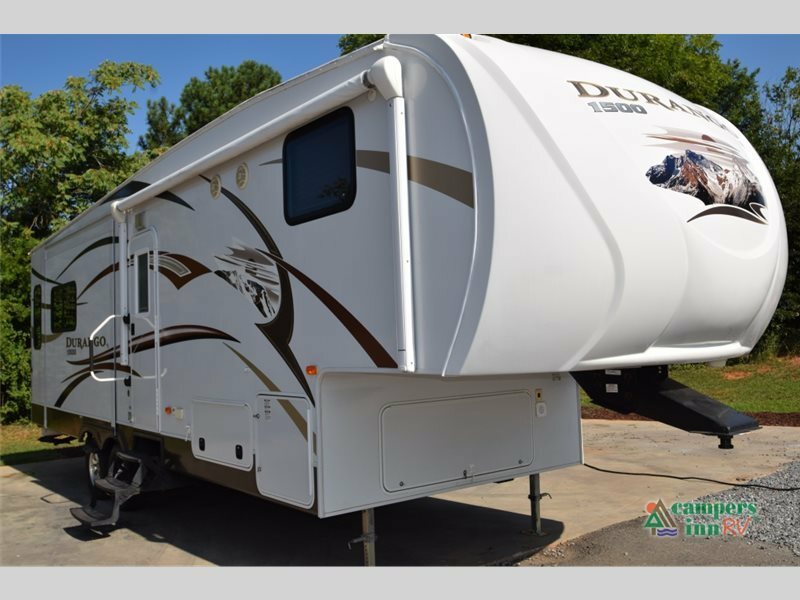 Center Slideout, 2 Lounge Chairs, End Table, Sofa/Refrig./3-Burner Range/Microwave Slideout, Double Kitchen Sink, Step Up to Bath, Toilet, Shower, Lav., Linen, Front Queen Bed, Double Closets, Linen Slideout, Overhead Cabinets Throughout, 14' Awning & Much More! 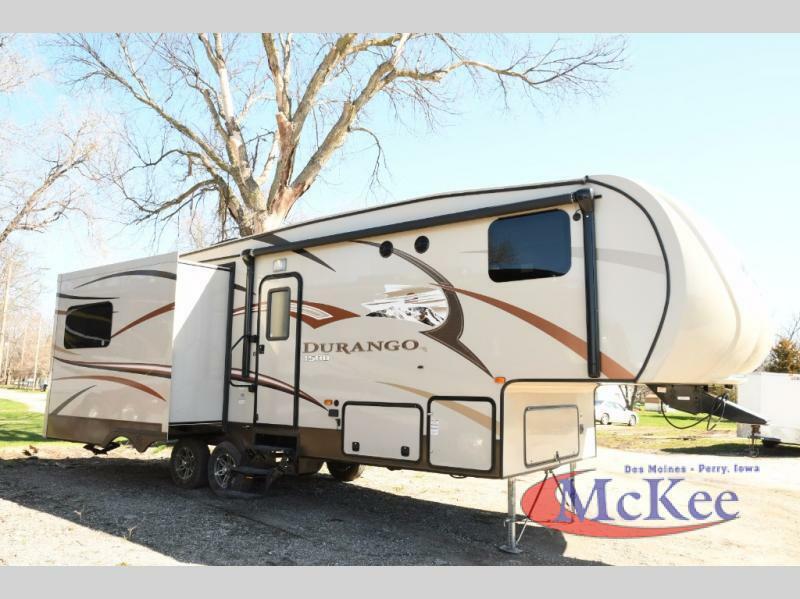 2015 Durango D295CS 877-485-0190 CALL DAVID MORSE 4 BEST PRICE 877-485-0190 CALL DAVID MORSE 4 BEST PRICE,POWER PATIO AWNING,ELECTRIC JACKS,FLATSCREEN TV AND DVD,AMFMCD,TRIPLE SLIDEOUT,REAR LOUNGE,FRONT QUEEN BED,DUAL BATHROOM ENTRY,MICROWAVE AND REGULAR OVEN,OUTSIDE SHOWER,REAR LADDER,WARDROBE SLIDEOUT,ALUMINUM WHEELS SPARE TIRE AND CARRIER.